One glance at the hulking 0-6-0 CNJ 113 and you must instantly conclude that you are looking at a seriously capable locomotive. Built in 1923, the 113 spent three decades wrestling heavy cuts of cars around the busy yards the Central of New Jersey Railroad. 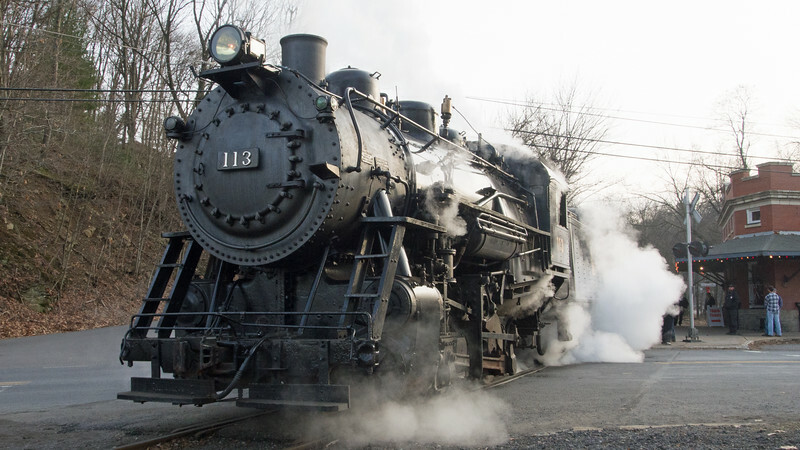 Retired in 1951, the 113 spent the next 40+ years passing from owner to owner before she was acquired by Robert Kimmel in 1999 and transported to Minersville, PA. There then ensued a two-decade-long volunteer restoration effort which resulted in the magnificent product seen here at the Minersville depot. With no leading or trailing trucks, every ounce of the 133's 197,000 pounds can be put to use and converted to tractive effort by the drivers. Just don't try and run it much faster than 15 MPH!